Soft Sided Coolers are lightweight and collapsible. They are great for day trips, the beach, picnics, sporting events or school and work lunch. You can even use them for grocery shopping. Insulated cooler bags are waterproof and have good thermal efficiency to keep your food and drinks nice and cool all day. 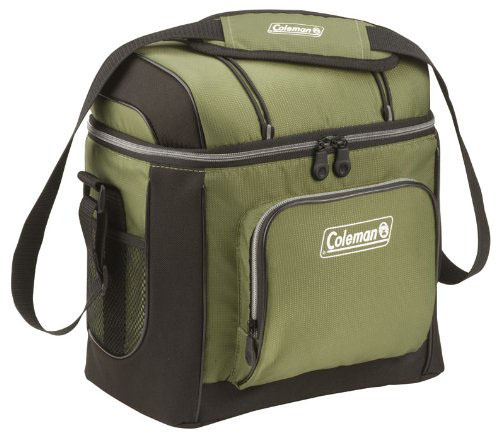 Some coolers come with hard liner such as the Coleman Soft Cooler which holds 16 cans inside and includes a removable hard plastic liner. The soft coolers also feature plenty of extra storage space with front zippered pocket, side mesh pockets, and mesh pocket in the lid. Another nice feature is its antimicrobial protection, which resists odor, mold, and mildew. Most soft sided coolers come with should straps or soft carrying handles. Some feature wheels and retractable handles for easy pulling.